You will find below the horoscope of Nathalie Karsenti with her interactive chart, an excerpt of her astrological portrait and her planetary dominants. If you know the time of birth of Nathalie Karsenti, we would appreciate it if you would send us your information with your source, at stars@astrotheme.com. To thank you for contributing to the enhancement of our astrological database, we shall be glad to send you the astrological portrait (34 pages) of this celebrity. Horoscopes having the same aspect Jupiter opposite Saturn (orb 0°22'): Joyce Jonathan... Find all the celebrities having this aspect. Horoscopes having the same aspect Venus trine Pluto (orb 0°47'): Jared Leto, Jimi Hendrix, Gisele Bündchen, Elizabeth II, Adam Levine, Kate Moss, Michael Jordan, Kat Bjelland, Gigi Hadid, Ricky Martin, Johann Sebastian Bach, Jimmy Page... Find all the celebrities having this aspect. Celebrities clicked on in real-time: 576,365,791 times. Here are some character traits from Nathalie Karsenti's birth chart. This description is far from being comprehensive but it can shed light on his/her personality, which is still interesting for professional astrologers or astrology lovers. 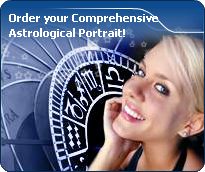 In a matter of minutes, you can get at your email address your astrological portrait (approximately 32 pages), a much more comprehensive report than this portrait of Nathalie Karsenti. Warning: when the birth time is unknown, which is the case for Nathalie Karsenti, a few paragraphs become irrelevant; distributions in hemispheres and quadrants are meaningless, so are dominant houses and houses' accentuations. Therefore, some chapters are removed from this part. Cheers for communication and mobility, Nathalie Karsenti! The predominance of Air signs in your chart favours and amplifies your taste for relations and for all kinds of short trips, whether real (travels) or symbolic (new ideas, mind speculations). You gain in flexibility and adaptability what you lose in self-assertion or in pragmatism. Like the majority of Earth signs, Nathalie Karsenti, you are efficient, concrete and not too emotional. What matters to you is what you see: you judge the tree by its fruits. Your ideas keep changing, words disappear, but actions and their consequences are visible and remain. Express your sensitivity, even if it means revealing your vulnerability. Emotions, energy and communication must not be neglected; concrete action is meaningless if it is not justified by your heart, your intellect or your enthusiasm. The Mutable mode is the most emphasized one in your natal chart, Nathalie Karsenti, which indicates a mobile character that is curious and thirsty for new experiences and evolution. You are lively and flexible, and you like to react quickly to solicitations, but don't confuse mobility with agitation, since this is the danger with this configuration - and with you, stagnation is out of the question. Security doesn't matter as long as you are not bored. You optimize, you change things, you change yourself... all this in a speedy way. After this paragraph about dominant planets, of Nathalie Karsenti, here are the character traits that you must read more carefully than the previous texts since they are very specific: the texts about dominant planets only give background information about the personality and remain quite general: they emphasize or, on the contrary, mitigate different particularities or facets of a personality. A human being is a complex whole and only bodies of texts can attempt to successfully figure out all the finer points. Your sensitivity is withdrawn, Nathalie Karsenti: more than anyone, you tend to lock yourself in your ivory tower, as you are aware of a kind of superiority that may be real, though overrated. Your moods are not perceptible because you control them with a tight fist. It is difficult to know if you are happy or upset because you show nothing. You avoid situations which compel you to reveal your emotions because you are not demonstrative. Please, be aware that it is not your amorous behaviour that is being analyzed, but the daily expression of your sensitivity. You dread the crowd and you need calm, and even solitude, to feel comfortable. You are well-equipped to remain balanced in all circumstances, but it may prove beneficial if you progressively take a relaxed attitude and show more dedication, as you are worth it; it is easier for you to exteriorize your feelings when your projects or your ambitions justify that you do so. You do not practice gratuitous outpourings, particularly when your are with a group, because you are afraid to open up, as if you were on the defensive, without any reason most of the times. Nathalie Karsenti, an enquiring intelligence, an instant understanding and a wide range of interests prompt you to go towards other people in all circumstances with a view to exchanging ideas and to show your talent for repartee. Ideas and actions must be quick and you are likely to be impatient, even critical and sarcastic with people who cannot match your frantic rhythm. You are very adaptable, you can do several different things at the same time and also think of a future action because you constantly need to be on the move. You may be criticized for your superficiality, for spreading yourself too thin and for your propensity to conceal the truth, but you always get out of tricky situations incredibly well because you are very astute, shrewd and charming. There is so much voluptuousness and so much charm in your personality, Nathalie Karsenti! You are what is called a “nature” and when confidence is established, slowly but steadily, you become deeply attached to your partner and you can be filled with passion. It may take months, even years, but you are so generous and affectionate that, in most cases, your relationship has many chances to blossom, with time. You are very physical and sensual and you are very keen to delight in your intimate moments. This aspect of your amorous relationship usually contributes to its sustainability. Everything seems idyllic, Nathalie Karsenti. It would be so if your jealousy and your possessiveness did not get started simultaneously with your powerful feelings. But you have so many assets, so be content! Nathalie Karsenti, the way you take action is quite paradoxical: you carry out your business perfectly well when you are in a teamwork with collective goals, but you do so in your original and individualistic manner: this is your main peculiarity. Your concern is to express your originality and your specificity while remaining immersed in a human community. You are curt and not very flexible. You are inventive and you easily fight authority, just because its very principle runs counter to the sacred values of freedom, independence and, above all, the absence of constraint. Competition does not appeal to you. You prefer to be useful and to conquer new territories of the humanitarian or the intellectual type. On the sexual plane, you are also often original and surprising regarding your fantasies and your tastes. This text is only an excerpt from of Nathalie Karsenti's portrait. We hope that it will arouse your curiosity, and that it will prompt you to deepen your knowledge of astrology, as well as to visit and use the wide range of free applications at www.astrotheme.com.